OPPO has launched its new smartphone Oppo A7 in China and Nepal. Here are the details of the smartphone in short. 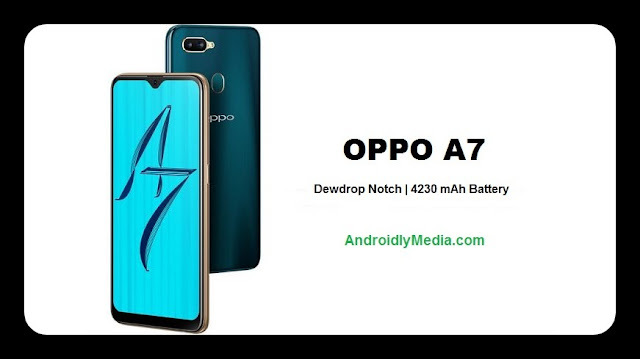 Oppo A7's main highlight feature is it's waterdrop notch display. It has a battery capacity of 4230 mAh. In China it is launched at CNY 1,599 (approx 16,500) and in Nepal it costs NPR 35,790 (approx 22,000). A7 has a 6.2 inch HD+ IPS LCD display with a 19:9 aspect ration body. The phone has a 13MP main sensor (f/2.2 Ap.) and 2MP secondary sensor (f/2.4 Ap.). On the front it has a 16MP Selfie camera with AI based features. It is powered by Octa-Core Qualcomm Snapdragon 450 processor, with Adreno 506 GPU and runs on Android Oreo (ColorOS 5.2). The phone comes with 3GB/4GB RAM and internal storage 32GB/64GB. External storage up to 256GB via microSD card.